Recently, at one of my favorite clubs to play I had the fight or flight response when I got on stage. My heart started throbbing in my chest, my throat got tight, and I felt like I had to pee. I was looking forward to being back home in NYC, and playing in front of people I know and love. I was bummed that the next fifty minutes might turn out so well. Performing is my favorite thing to do when I’m doing it well, and the opposite when I’m dying a slow death out there. Another technique I teach came into my head and I started to visualize a tiny sun in the middle of my chest. I let the sun grow until it surrounded my body, then until it filled the room. I could open my eyes, and see everyone in the room in my sun. This gave me focus. After the first song, I took my time while I tuned the guitar and I held my breath, counting slowly backwards from ten in my mind, twice. This stilled my diaphragm and stopped my voice from shaking. Learning to control the diaphragm is not only the most important component of learning to sing well and support the voice, it is your first defense against stagefright. If the diaphragm is trembling, you will feel nervous. If you can still it, you will feel focussed – my concentration grew. I was able to think through the story of the next song, hear the sounds of the piano, and then like magic, I felt like I was swimming, instead of sinking. I became so at home on stage that when I sang the wrong words to my song “This Can’t Be My Life,” it became the part of the show everyone felt the most connected to. There are no mistakes in a live show – only improvisation. What causes stage fright? For me, it isn’t that I’m afraid of being judged, laughed at or forgetting the words. It is a physical response that seems to happen at random. Sometimes when the stakes seem high, sometimes when there are no stakes at all. It’s cellular; I feel like I’m going to get eaten. My mind goes, “Dance, Monkey, dance or you’re going to die.” It could happen anytime, unpredictably, but I love to play, so I risk it. I tell myself I’m not nervous; I’m excited. I remember, no matter what, I’ll be able to sleep in my bed later. I hold my breath. This works better than deep breathing, because it stills the diaphragm. Don’t breathe in and blow out hard. As in the support techniques of The Singingbelt System – expand, hold, release gently. I build a tiny sun. I think through the thoughts of the song as if they are occurring to me for the first time. I follow the story. I imagine the faces of particular people and sometimes pets that ease my mind, and place them in various places in the room. I listen to the music. If I’m fortunate enough to be playing with others, I listen to them playing. I am grateful to people for listening. I talk as if I were speaking to one friend. I sing as if I were singing to one person. 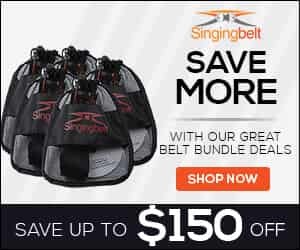 For less than the price of a lesson, the Singingbelt System will unlock the secrets of diaphragmatic breath control and teach you to be a better singer. 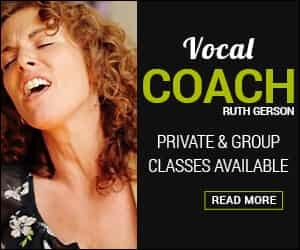 With the extensive training video and practice CD, it is like have your own private vocal coach.